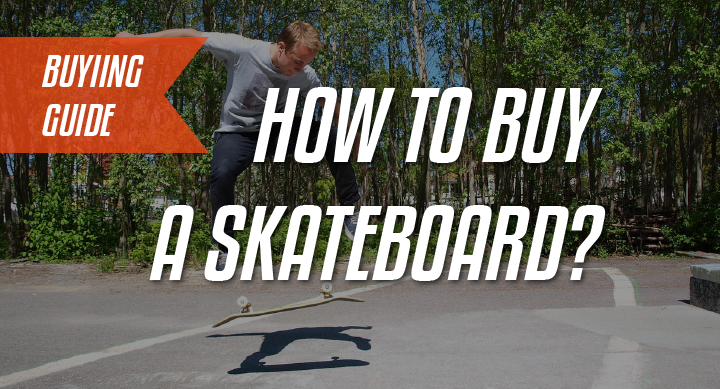 →How to buy a skateboard if you’re just starting out? How to buy a skateboard if you’re just starting out? So you are interested in skateboarding huh? I welcome you to one of the most rewarding, exciting and fulfilling sports out there. With so much info out there, it is overwhelming for someone who wants to get into skating, but in today’s article I will break down the basic knowledge that everyone needs to know about skateboarding. I’ll also tell you how to buy a skateboard and the best place to get gear. After reading this, you’ll be able to pick a board that suits your needs and you’ll be ready to dive into the deep end. Enjoi White Panda | 7.75 Street skateboarders with smaller feet. Zero Single Skull | 8.25 Street skateboarders with bigger feet. Sector 9 Nicaragua Commuting, just riding around around. This part of the skateboard that you stand on, it typically has two kicktails and a flat bit. This type of shape is known as a ‘popsicle’. So a normal skateboard is about 30in in length. Any larger and it’s probably a longboard, any smaller and it’s probably a short cruiser board (like a Penny). 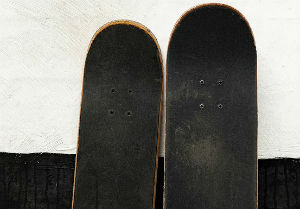 Skateboard decks come in widths from 7.5in to 9.5in. What decides the width is the type of skating you want to do. A bigger board would mean more stability and is better for doing tricks in a bowl, transition skating, and cruising. A narrower board would be more nimble and is better for doing flip tricks and street skating. 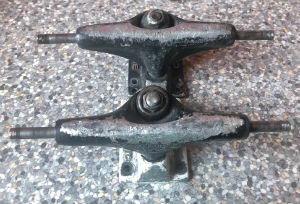 The difference half an inch will make is minimal, so a 7.75 skateboard vs an 8.25 one will act almost the same but maybe be more comfortable according to your shoe size (and if you’re buying a skateboard for a kid). If we are honest, it’s all a fashion statement. You can only feel the real difference at the edge of the spectrum. I recommend beginners go for an 8in skateboard. This board will be the best of both worlds and be a good starting point. Finally, there are some variations in the concave of the decks, but this doesn’t really matter as you start out. The important thing is to get you to start skating. Eventually, you’ll have to get another deck due to wearing out your first one. Don’t be afraid to experiment with the next one and pick something different. Don’t pick the wrong trucks! The trucks are the metal things at the bottom of the board. They come in different widths and heights. Truck width is usually determined by the width of your skateboard. So an 8in deck should have a truck with 8in axles/139mm hangers. It’s a bit confusing how the width is measured, as we use both the hanger and axle width or just one of each. If it’s measured by the axle it will be in inches, if by the hanger it will be in millimeters. THESE ARE DIFFERENT WIDTHS, so be careful. If your trucks are a smidge large/smaller, it’s not something to worry about. Next up is the height of the trucks. Taller trucks are better for cruising and carving but are more unstable. On the other side, low trucks give you better stability and are great at flip tricks, but don’t turn that well. So mid-level trucks are ideal, they are good for everything and we recommend these to beginners. If you need to increase the height of your trucks, you can always use riser pads. These are what keep you rolling. Typically skateboarders use wheels ranging from 50-59mm in diameter (how tall they are), and hardness of 95a to 101a (the lower the number the softer they will be). Riding styles and personal preference will decide what features your wheels will have. For beginners we recommend wheels that are 96a-99a and 54-59mm in height. These are of average size and hardness. They are the perfect starting point, they aren’t too tall or too soft. Wheels 50-53mm are good for doing tricks, street skating, bowls and other technical styles. 54-59mm are good for skating street, parks and ramps, and wheels 60mm+ are best for cruising. This is because the taller the wheel is the harder it will be to flip, but it will roll a lot better. Harder wheels are better for smooth skate-park floors but will perform badly on the street. The best way to figure out the right skateboard for you, is by riding one … a lot. So simply walk in a skate store or buy a complete online. Don’t buy a board from Walmart or online if it’s too cheap. You get what you pay for and they probably won’t ride or perform tricks that well. P.S we haven’t forgotten the grip or bearings because tbh they don’t matter that much. Any brand will do and don’t let anyone lie to you that it does.